From what I hear, Toronto's Steeles Avenue was quite the scene today. Reporters and paparazzi flocked Steeles Memorial, the Jewish funeral home, in hopes of capturing Corey Haim's private funeral. About 200 close friends and family filled the invite-only private funeral. Fans stood quietly outside the chapel lawn during the 45-minute service, which took place in the late morning. 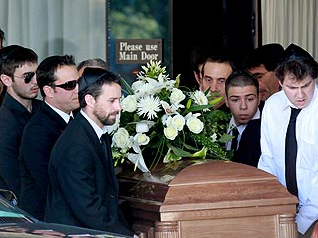 The above picture depicts friends and relatives carrying Haim's casket out of the funeral home while wearing their kippot. What I want to know is if Haim is actually pronounced Chaim? Toronto has received a great deal of attention ever since Haim's mother Judy announced that his funeral would be held in his hometown of Toronto. The internet was buzzing with reports that the City of Toronto was paying for his funeral (false) and that Steeles Memorial would be one of his final stops (true).